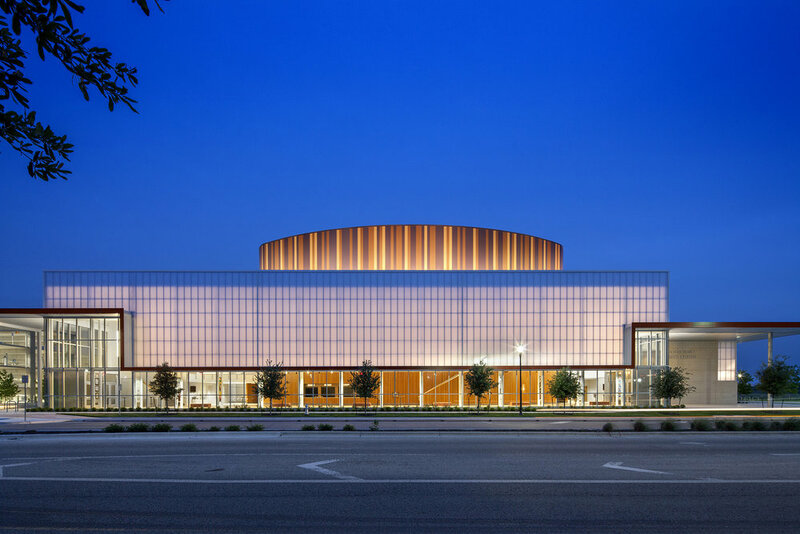 Designed with Pfluger Associates Architects, the Performing Arts Center (PAC) is the first district-wide Fine Arts facility in the 134-year history of the Austin Independent School District. Approved via special bond election, the state-of-the-art venue serves more than 84,000 K-12 students at 129 schools. Instead of a sprawling suburban site, the PAC is located on the grounds of the Mueller Development, a former airport that is being transformed into a vibrant, pedestrian-oriented community in the heart of Austin. 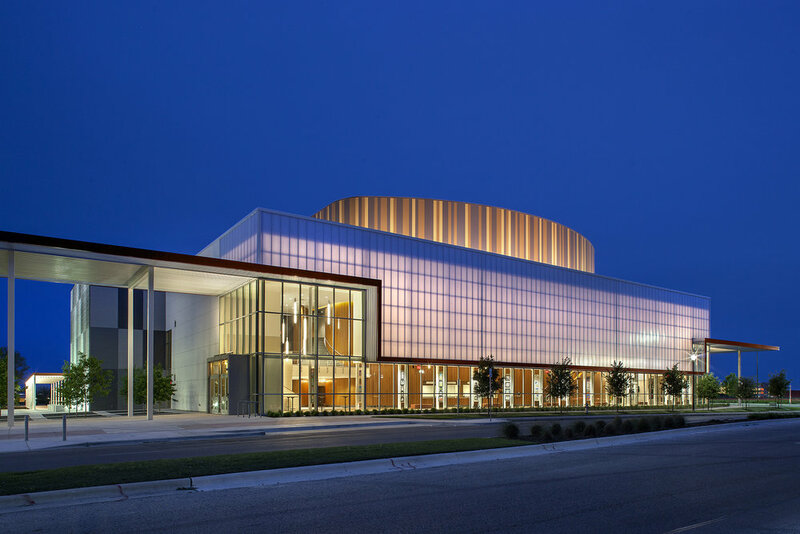 A landscaped plaza and amphitheater are open to the public, while a ribbon-like aluminum and steel trellis wraps around two sides of the building, converging at a dramatic, cantilevered porch that defines the main entrance. Glass and translucent panels bring in light during the day, and create the effect of a glowing lantern during evening performances. Clad in maple and walnut, the main auditorium seats 1,200 people on two levels. Mechanized acoustic drapes allow the space to be tuned to the needs of any performance—from a full orchestra to a solo vocalist—at the touch of a button. In addition to the main auditorium, the facility contains a 250-seat black box theater; 4,690 sq ft dance studio; 2,600 sq ft multipurpose room; kiln room; and individual recording studio. The project has received LEED Gold certification, and earned a 5-star rating from Austin Energy Green Building. A 60 kW rooftop solar array will offset up to 8% of the building’s annual energy needs, while daylit offices and public spaces reduce energy use. When compared to a baseline case study, the PAC achieves the following: 23% less overall energy use; 100% less irrigation potable water use (via graywater recycling); and 33% less indoor potable water use. 44% of building materials were sourced within 500 miles, and the building contains 33% recycled content.